Love the simple and no fuss method. I just have to use a mixing bowl and a rubber spatula to mix all the ingredients together...not much washing involved and I know for sure, I will surely want to make this again for our sunday breakfast. You can eat them plain or apply some sweet butter or any fruit jam on them and you will have a satisfying scones for your breakfast or afternoon tea. Lovely , and I know Dorie's recipes will never disappoint me. These scones are best eaten on the same day. Center a rack in the oven and preheat the oven to 400 deg F . Line a baking sheet with parchment or a silicone mat. 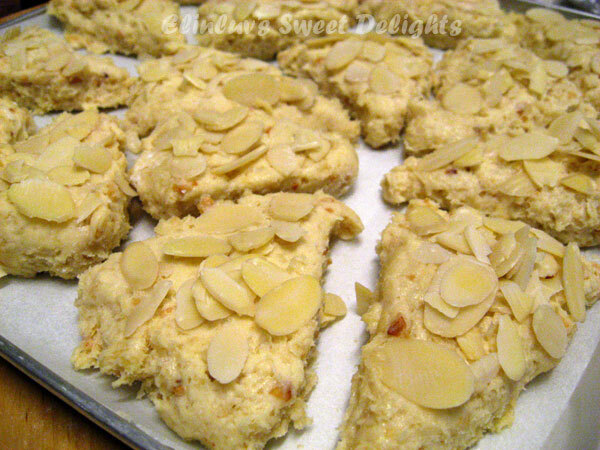 Divide the toasted almonds in half. Finely grind ½ cup in a food processor or blender with the sugar, taking care not to overgrind the nuts and end up with almond butter. Finely chop the other ½ cup. Whisk the flour, ground almonds and sugar, baking powder and salt together in a large bowl. Drop in the butter and , using your gingers, toss to coat the pieces of butter with flour. Quickly, working with your fingertips ( my favorite method ) or a pastry blender, cut and rub the butter into the dry ingredients until the mixture is pebbly. You’ll have pea-size pieces the size of oatmeal flakes and pieces the size of everything in between – and that’s just right. Bake the scones for 20-22 minutes or until their tops are golden and firmish. 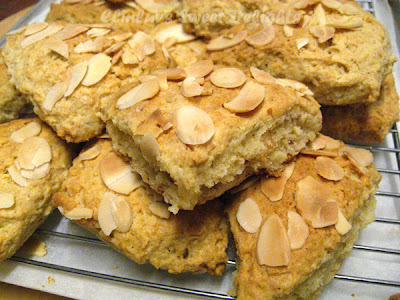 Transfer to a rack and cool for 10 minutes before serving, or wait for the scones to cool to room temperatures. Beautiful scones. 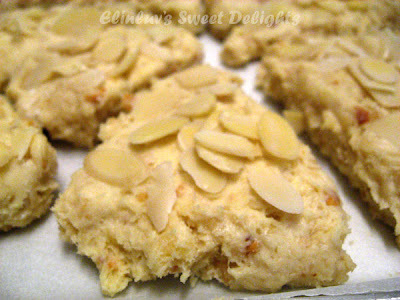 All the almonds sound amazing! 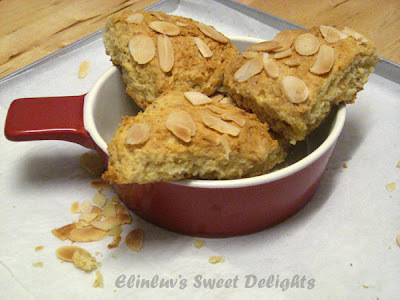 I am going to have to try to make scones myself soon! Beautiful! My husband would go ga-ga over them! 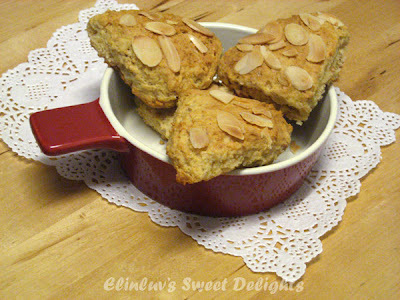 Elin, I haven't eaten scones for a long time. 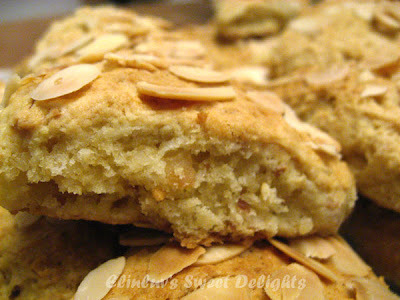 One of my line dancing mate makes awesome delicious scones but not with almond flavors. Yours sounds so good. Wish I have one with my coffee right now. 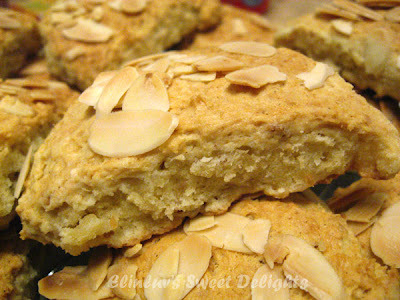 i used to make scones every weekend for breakfast, now that I read your post I try to remember when and why I actually stopped making them. Anyhow, your scones sound great. Love the 3 almonds :) I bet they have a great texture.